Guinea pigs, like all other animals, occasionally have bouts of discomfort that only a good, vigorous scratching can solve. However, certain skin conditions and parasite infestations can cause major discomfort and itching, and even lead to hair loss and life-threatening illnesses. If you notice your guinea pig scratching frequently, you should check him out for any potential problems. Occasional scratching is nothing to worry about with a guinea pig. Typically, a guinea pig will have a good scratch when he wakes up from a nap, or he might scratch himself after grooming. An occasional itch during the day is usually nothing to be concerned about either, and changing bedding or hay may provoke some scratching due to dust or other irritants. As long as your guinea pig seems to settle down afterwards and shows no outward signs of pain, chances are the scratching is perfectly normal. A fungus infection of the skin can cause a guinea pig to scratch frequently, irritating his skin and even causing his hair to fall out. Typically, exposed skin will be red and irritated, and may sometimes have a white dandruff-like residue on its surface. A guinea pig will squeak or cry out in pain when scratching a fungus infection and his hair can fall out in clumps. Fortunately, most fungus infections are easy to cure, and your vet can provide the proper ointment or shampoo after identifying the specific fungus. In advanced cases, your vet may also provide antibiotics or other medication to help your pig recover from his skin disorder. Another common source of itching in guinea pigs is mange mites. Mange mites are tiny parasites, invisible to the naked eye, and they can live on a guinea pig for years before an infestation becomes dangerous. A mite infestation may start due to stress on the guinea pig's immune system, possibly caused by a change in living conditions or other illness. When a guinea pig suffers from mites, he will typically begin to lose hair along his back and rump, with the hair gradually thinning until the skin becomes visible. The itching can be intense, and in advanced cases can even cause seizures. The most common treatment for mange mites is ivermectin, a topical or injected anti-parasitic that your vet can provide. Your guinea pig will need at least two doses a week apart to kill any mite eggs, and you may need a third dose to ensure that the infestation is completely gone. 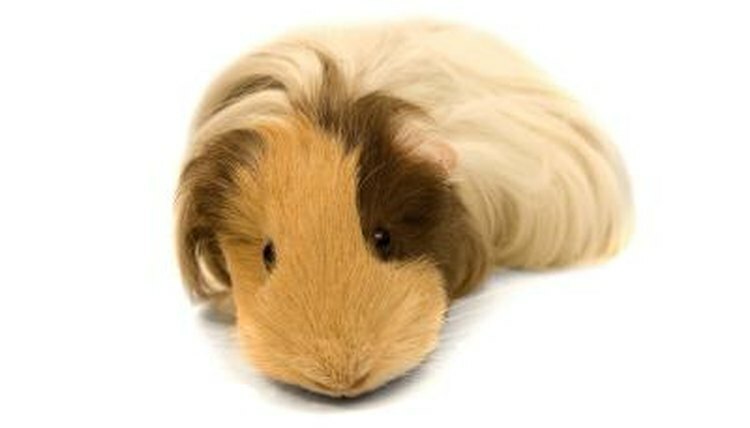 Guinea pigs can also suffer from lice. These parasites are larger than mange mites, and you can see them moving around between the hair follicles upon close examination. A guinea pig with lice may have them all over his body, but they may be easiest to spot in the short hair around the animal's face. Lice may not cause hair loss unless the infestation is particularly severe, but they can trigger painful bouts of itching. Your vet may prescribe a topical product similar to spot-on treatments for dogs and cats to remove a lice infestation.